Maritime Styling For Babies And Young KidsWith its fun hardware, this piece from the Aviron collection has a truly original nautical style! It’s sure to be the centerpiece of your nursery, and its handy storage spaces make it really useful. This changing table will create a cozy atmosphere for your little one. Turn it into a dresser once your child grows up by removing the changing station! 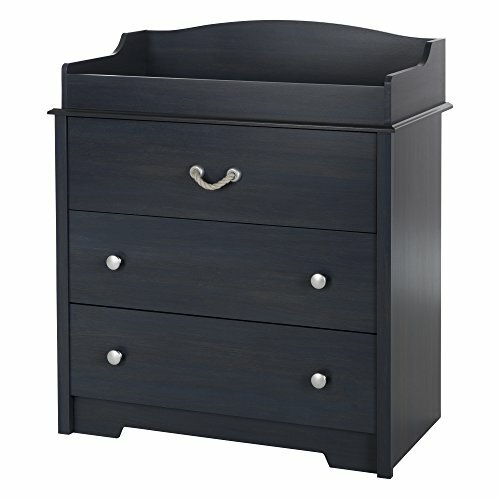 The top drawer features an easy to pull rope-like handle and the bottom two drawers with cute knobs.Versatile StorageThis changing table features 3 large drawers with smooth metal slides for quiet and easy access. Use the versatile storage for clothing, bedding and baby accessories. When the time comes, the changing table can be turned into a double dresser for your child’s bedroom by simply removabling the changing station.5-Year Limited WarrantyShop with confidence knowing that we proudly stand behind this Changing Table with a full 5-year limited warranty. Assembly is required. Changing pad and accessories are not included. Meets or exceeds all North American safety standards. Ships in a heavy box, make sure to have a friend with you. Packaging tested and certified to reduce the risk of damage during shipment. We recommend 2 people to assemble. Tools are not included. Made in North America with non-toxic laminated particleboard. South Shore Furniture's support team is available 7 days a week if you have any questions.